Edible flower pots; not a challenge for our chefs! Home > Dundas Castle > Edible flower pots; not a challenge for our chefs! 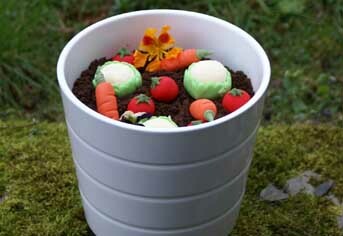 10 Apr Edible flower pots; not a challenge for our chefs! What better way to get a taste of the start of spring… At the start of every year we like to pop out to our clients with a wee gift to say thank you for their continued support. As self-confessed ‘foodies’, we work with our exclusive catering partner ‘Prestige Venues and Events’ to create edible treats relating to a particular theme. This year we heralded the start of spring by creating an edible plant pot! Dundas Castle’s Head Chef, Tom Beauchamp never lets us down. We proposed the idea of the edible plant (thinking it might be a little far fetched!) and left it with him… a couple of days later Tom came back with not only a workable concept but recipes that blew us away. With the expertise and creativity of Head Pastry Chef, Phil Elwis and his Pastry Commis Chef Teri White, a colourful pot of carrots, cauliflower and tomatoes was born. Our clients received a ceramic pot which had alternate layers of carrot cake and courgette & lemon cake, interspersed with layers of orange buttercream and pistachio buttercream. This was then topped with a crumbled cookie dough to look like soil and finished with vegetables and fruit which weren’t all that they seemed – irn bru flavoured carrots, rhubarb flavoured tomatoes and pear flavoured cauliflowers. Of course, no plant pot is complete without edible nasturtium and viola flowers! We’re very proud of our partnership with Prestige Venues and Events who never fail to impress. As an authentic Scottish Castle which houses the most opulent rooms with exquisite furnishings it’s great for us to be able to offer a unique mix of traditional luxury with an innovative and modern twist!